The Utah Olympic Park may have been designed as place for the world’s best athletes to compete in the 2002 Winter Games, but it has now become a destination where families can find adventure throughout the year. While it may still be the place for winter sport training, the summer season is filled with family activities that are unique in the state. Whether you like to go fast, climb high, or simply enjoy the incredible views, you can find plenty of ways to enjoy Utah Olympic Park. Here are seven of our favorite ways to enjoy the trip as a family. Let’s start with the park’s signature ride that draws in folks who want to see just what it’s like to ride in a real bobsled down an Olympic track. In the summer, the Comet Bobsled switches from blades on the ice to wheels on concrete, but riders will still get the same thrill ride down the park’s bobsled route that was used in the 2002 games. Don’t worry, a trained pilot will guide up to three riders in the sled, so you don’t need to know how to steer. Riders must be at least 13 years old and 100 pounds, so this is for the older kids. You can expect to reach speeds of up to 60 mph during the minute-long ride. Thrill-seekers won’t be disappointed. Extreme tubing takes riders down the landing hill of the ski jump. The bobsled course isn’t the only way to catch some gravity-fueled thrills—you’ll find two other sliding options at the park that can be just as much fun. The Alpine Slide features a smooth downhill ride down a metal track on a wheeled sled. You can control the speed of the easily controlled sleds, so the Alpine Slide is a good option for those who may not want a hair-raising experience. (Although, since you control the speed, you can let the sled run and go plenty fast.) The track includes 18 banked turns for an exciting trip down the mountain. Younger riders, but at least three years old, can ride with an adult. 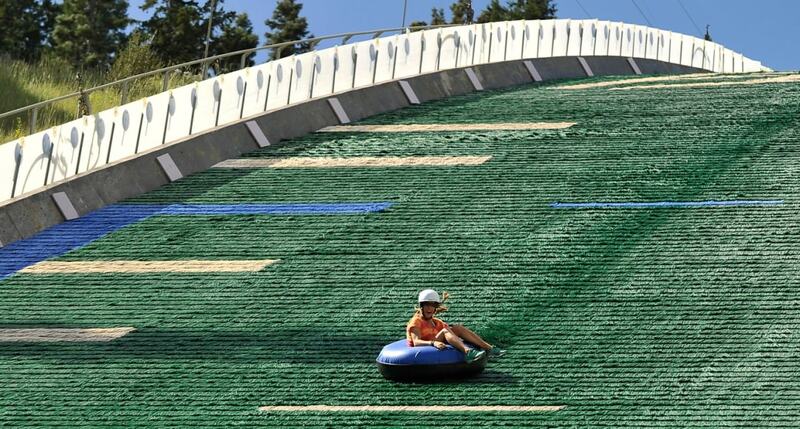 The other sliding option at the park is Extreme Tubing, which allows you to take a ride down the landing hill of the ski jumps on an inflated inner tube. The plastic surface allows you to slide just like snow, and you can expect to reach speeds up to 50 mph. You have two choices, as the tubing is available on hills of both the larger jumps and smaller jump. Riders must be at least 5 years old for the small hill, 13 years old for the big hill. This isn’t your ordinary climbing wall. This is "deep water soloing," which means that the wall is angled to hang over a deep pool of water. The climbers ascend without being roped in, and one false move and it’s in the pool. Of course, that’s part of the fun as well. Climbing shoes are available for rent—and bring your swimsuit. This is more suitable for older kids, but everyone can enjoy the show as you watch climbers tackle the challenge. 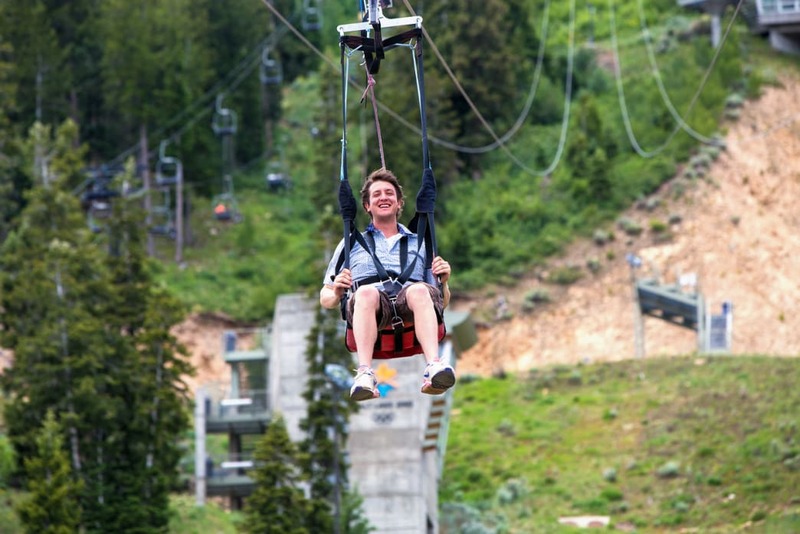 Visitors to Utah Olympic Park can choose from several different zipline rides. 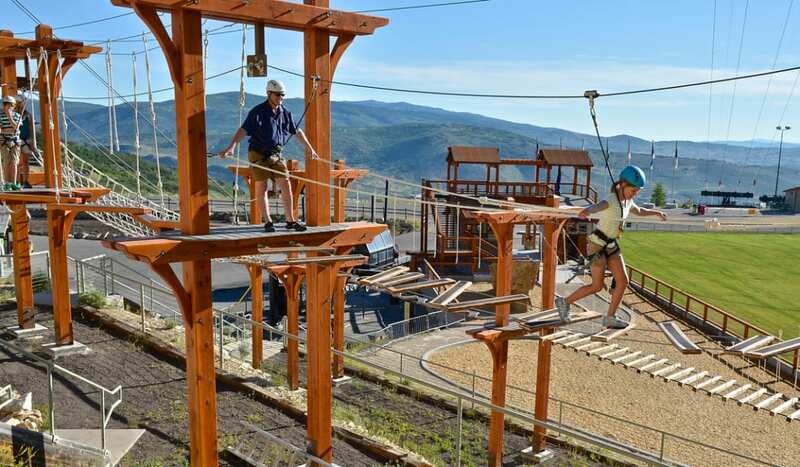 Utah Olympic Park offers several zipline course to choose from, catering to a wide variety of experiences for most members of the family. The Extreme Zipline is big, steep, and long, taking riders from the edge of the K120 ski jump down the mountain at up to 50 mph. Two ziplines allow two family members to ride alongside each other. The ride is available for anyone from 100 to 275 pounds. The Freestyle Zipline is a shorter and features slower—but still fast—speeds. It’s a perfect start before moving up to the big one, and better for young children and those looking for a more leisurely ride. (Participants must weigh at least 50 pounds.) Whichever ride you choose, you’ll find unparalleled views of the area. For an additional thrill, consider taking on the Drop Tower, an advanced-level activity that starts with a 377-foot long zip line that ends at the 65-foot tall Drop Tower. From there, you’ll do a freefall rappel to the ground. The ropes courses let you climb high above the park. Another of the park’s signature attractions is its wide variety of ropes courses. Users put on a harness, tie into the safety line and start climbing around these man-made structures that reach up to 55 feet in the air. The advanced level Summit Adventure course includes wire traverses, swinging elements and problem-solving challenges. Participants must be at least 45 pounds, and those younger than 13 must complete the Canyon Course first. The intermediate level Canyon Course features a log traverse and other balancing challenges up to 25 feet in the air. It’s recommended for those age 7 and older. Finally The Discovery Course is designed for younger climbers and beginners to give them a taste of exploration without getting too high off the ground. Fans of American Ninja Warrior will enjoy this obstacle course that is tucked high above the park. No special gear is needed for this free activity, which invites users to test their strength and agility by completing the course without touching the ground. You’ll find a warped wall and all other manner of hanging and climbing obstacles to conquer. For younger kids, the Discovery Zone is similar playground with lots of climbing obstacles to conquer. While the Spence Eccles Olympic Freestyle Pool is primarily used by skiers and snowboarders to practice their aerial moves with a soft (that is, wet) landing, it is also home to one of the most fun events at the park—Slip ’n Soar. Three times throughout the summer, the ramp is turned into a slip and slide, and users can slide down the ramp and be thrown into the air before landing in the pool. You’ll see some amazing tricks as riders complete all sorts of acrobatics before landing in the water. Even if you or your kids aren’t interested in participating yourself (and users must be at least 13 years old for two of the events, 18 for the July 4 event), it’s still a great time to visit and enjoy the show. Written by Jeff Banowetz for RootsRated in partnership with Utah Office of Tourism. Insect Shield technology converts clothing and gear into long-lasting, effective and convenient insect protection.